At the edge of the winter solstice, dark falls before it's quite evening, jewelry tones deepen, richer colour beckons. I bring out my antique or vintage earrings, along with the thickest sweaters. What looked heavy in summer now pleases. Browsing local fine jewelers, I'm once again led to the past, where stone quality and design endure, undiminished by a century's passage. Pieces made in the Victorian (1840-1901) and Edwardian (1901-1915) periods are still fairly easy to find at auction or in antique jewelry shops; the workmanship is superior to most branded-jewelry lines today. 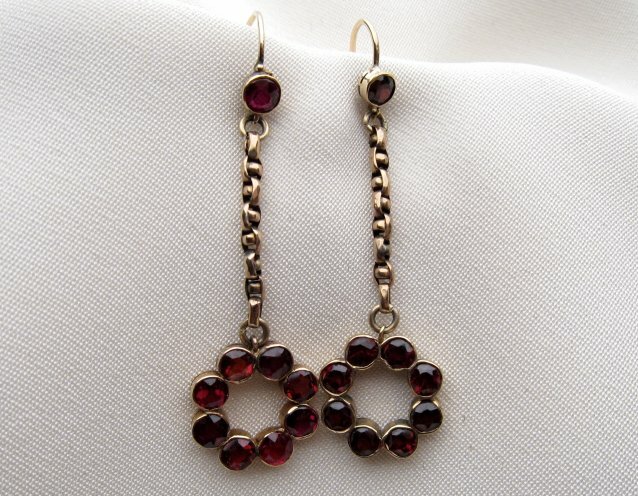 Faceted garnet earrings, ca. 1910, about 40mm long, for pierced ears. Price, $990 from Isadora's. 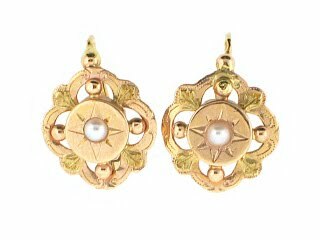 Wear with a simple sweater and pants, no longer a 'uniform', but rather an elegant frame for these sparkling antiques. Ca. 1880 rose gold and turquoise dangles with beautiful cabochons and large teardrop stones set in gold borders. Price, $975 from A. Brandt and Sons. The grace and romance of these Victorian silver and Scottish agates (white, moss and carnelian) earrings would make the simplest sweater sing. From A. Brandt and Sons; price, $790. Delicate seed pearl and 18k earrings with bead accents. About 1/2 inch in diameter, yet generously infused with character. From Beladora II; price, $333.75. Here's a nut to squirrel away for the winter! 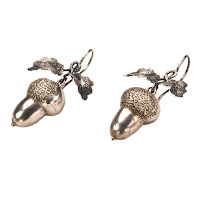 1st Dibs seller Glorious Antique Jewelry offer well-modeled Edwardian silver acorns, with texture and contrast. The leaf spreads 3/4 inch wide, the hanging length, 1 1/2 inches. Price, $1,200. 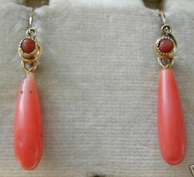 Luscious Victorian carved coral drops set in 18k gold, probably French, with slight wear that would not diminish my pleasure one bit. Price, £250 from Laurelle Antique Jewellery. 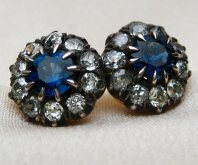 If shopping for a special purchase, consider these regal beauties: Victorian sapphire and diamond earrings, ca. 1900. Total weight of the sapphires is 1.60cts, the European-cut diamonds, 1.02cts. Price, $4,085 from Isadora's. Each piece delighted a woman a century ago, and is poised for a second life today. Victorian and Edwardian earrings mix happily with many modern bracelets and rings. The only thing is, they do fancy a cup of tea at least daily. I love the Victorian silver and agate earrings. tea twice a day is not a steep price to pay ! 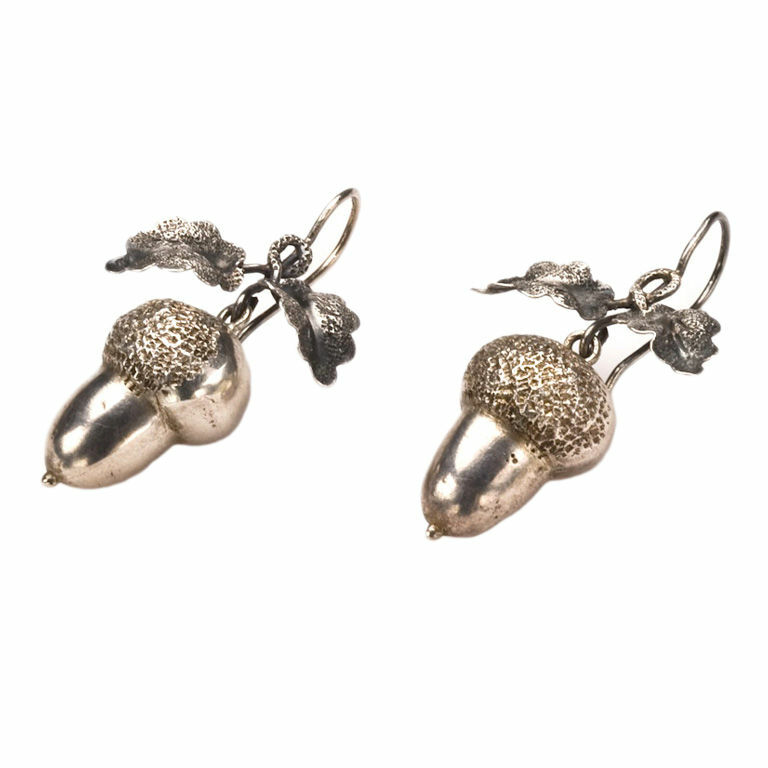 The wee acorns are so charming! And they wouldn't break my white metal only rule...let's not talk about the budget! 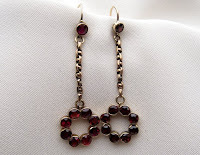 I absolutely love those garnets - but they are well out of my price range. 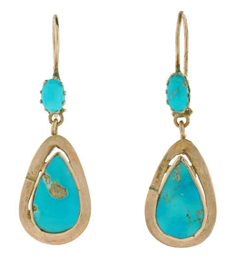 I will take those turquoise earrings and give them all the tea they want:). I'm such a tea granny already, these babies would all feel right at home. . . seems like the kind of post a husband should see. . . I've spent a bit of time looking at the wares on the links Duchesse provided. I find that I like antique jewelry best. I keep reminding myself that women over 50 should not be wearing demure dainty jewelry, but rather things that make a statement. 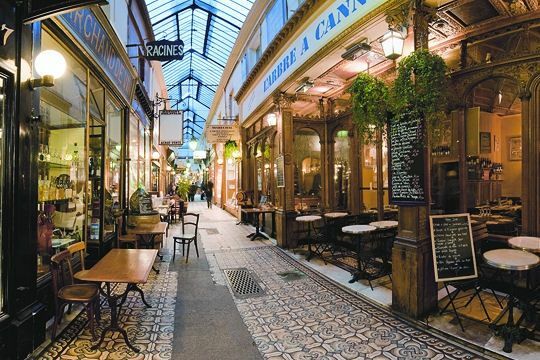 Thanks Duchesse for the encouragement to expand our horizons when it comes to jewelry. Pseu: The value is outstanding. Susan: They are especially romantic! 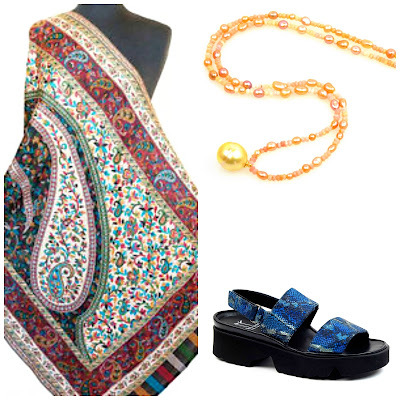 Yes, women are wearing jewelery too small and conventional- often b/c men just go into a dept. store. Rubi: I wore only white metals for years, but now enjoy both. Alienne: Garnets are not so hard to find, though, so keep an eye on your local antique stores. LPC: Great eye they are beauties. materfamilias: Yes! Many husbands default to a dept. store counter, and these are so much better, both in quality and price. 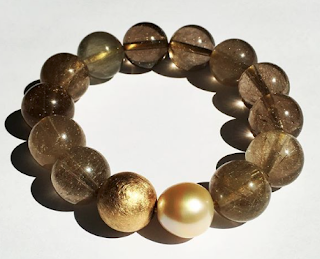 I think some women may wear smaller jewelry because they don't have confidence in their sense of style--and would fear tiring of larger pieces which make a statement. At least that might be true in my own case. Duchesse, keep educating us! We are teachable! Those sapphire and dimaond earrings are precious...and I have just the ring to go with them. We have a lot of anique jewelry on the way on Beladora2 after the holidays. Be sure to check in. Wishing you a happy, healthy and prosperous 2011! What lovely selections you have found. 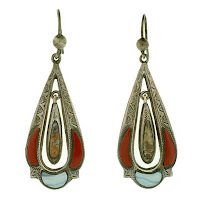 I'll go along with all the rose gold and turquoise lovers but the Victorian earrings with the agates are also very appealing.